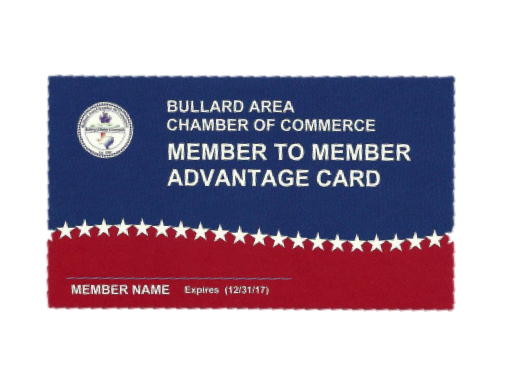 The Bullard Area Chamber of Commerce would like to present our new BACC Membership Card Program. All Chamber members in good standing will receive a personalized card. These cards will provide benefits to you from many participating businesses. As an additional means of marketing and advertisement we are providing an avenue for you to promote your business through this new program. We are asking all business owners to participate by providing a discount or free gift to other Bullard Area Chamber members. 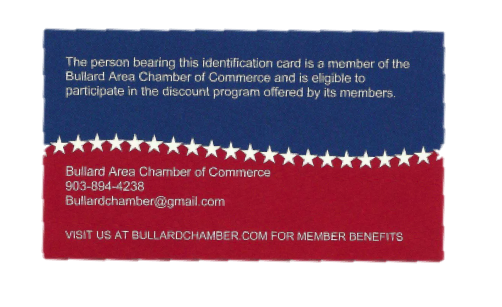 Please email the Chamber at bullardchamber@gmail.com to promote your business and support the Bullard Area Chamber members and the Bullard community.